In 2011, all we had was a great idea, a big heart, a small team and a lot of energy. Today we still have great ideas, we still have a big heart, we have a growing team and we have even more energy. We get this energy from you, our dear passengers. We are striving to do good work and provide you with affordable, comfortable and reliable transfers to and from the airports. GoOpti traveled to the Moon and back 40 times in these five years. That means our vehicles reached 31 million kilometers! 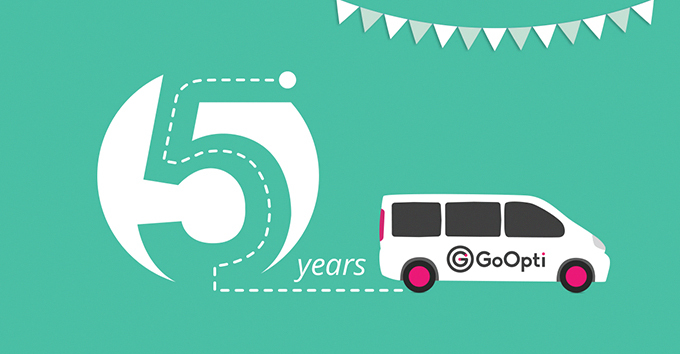 We've carried out 74,000 transfers and more than half a million passengers chose to travel with GoOpti! Currently, we offer transfers to 27 airports in 6 different countries. And all that just because of you. From the bottom of our hearts, thank you for trusting us and we can’t wait to see you on your next GoOpti ride. Thank you and here’s to another five!